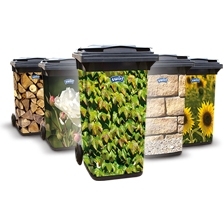 Swirl® puts an end to bin liners coming loose and soiled bins. The bin liner with the elastic fixing cord from Swirl secures bin liners in the right position: fixed around the edge of the bin. After removing the liner from the bin, simply use the fixing cord as a practical carrying handle.